Happenings in our tropical garden continue to intrigue us during the last two months of July and August. To some people, these may seem so ordinary that need no mention, yet to my beloved John and I, they are treasures to behold! Wonders of nature that have somewhat become our daily dose of joy to keep us happy, cheerful and thankful. 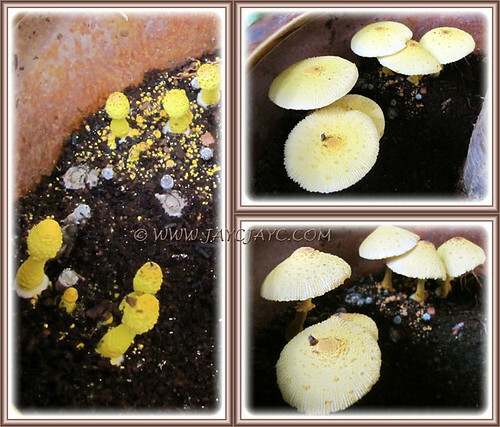 Indeed, we were fascinated and observed its growth closely. 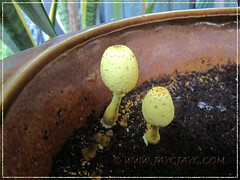 Very short-lived… first seen as bright yellow dots scattered on very damp potted soil and in two days or so, a stem will emerge with a brilliant yellow egg-shaped head. The next morning, it’ll bloom into an attractive, pale sulphur-yellow mushroom that will drop dead by evening and decompose to become nutrients for the soil. Beautiful and enticing, but hands off please. 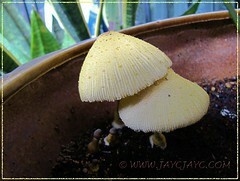 Yellow flowerpot parasol or Yellow houseplant mushroom, a species of gilled mushroom in the family of Agaricaceae, is inedible and poisonous, and when ingested will cause significant stomach problems. Sunbird, an unexpected sunbather on the inflorescence of Costus woodsonii, all fluffed up like a soft toy, shouting to be cuddled. 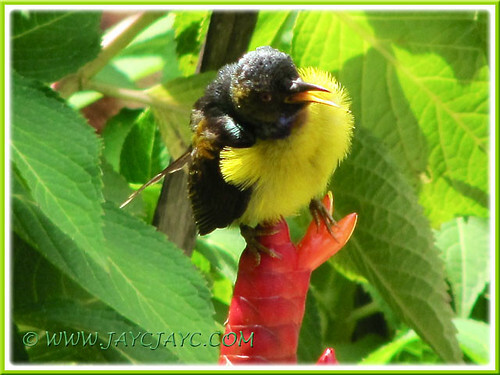 This pretty sunbird, adorned in brilliant yellow was easily spotted as we returned home from lunch one bright afternoon in July. With camera in hand, I alighted from the car ever so slowly and moved towards it as close as I could. Just managed to have only one shot before it swiftly took flight. I was delighted that the image turned out pretty clear and enabled me to crop a distinct version as seen below. I was somewhat disappointed though, to have captured just one shot. Well… better one than none, right? Moreover, the choice to pose or not rest on the sunbird and I have no control whatsoever! 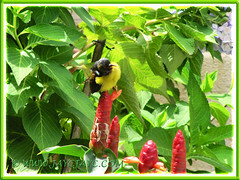 Usually seen in our garden are the olive-backed sunbirds that come daily to enjoy the nectar on the Costus flowers. It’s almost impossible to photograph as they are super-sensitive and will take flight the second they detect the slightest human movement. Mighty glad that while trying to identify this bird, I came across a captivating site on Malaysian Birds, that presented such impressive photos for me to enjoy and be enthralled. Kudos to Mr. Khong Tuck Hoon for generously sharing his great passion and expertise. 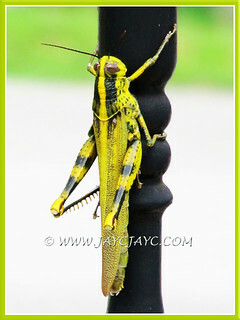 A gorgeous Grasshopper came visiting too and was seen clasping onto our main iron gate for dear life. If not for my beloved John who called me out to the garden one late evening, I would have missed this beautiful insect. 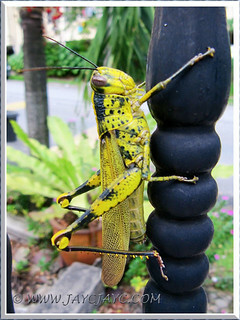 A large grasshopper, wonderfully clothed in yellow, with black blotches and spots – haven’t seen this for about half a century. It’s commonly named ‘belalang kunyit‘ in Malay, resembling the yellow colour of turmeric (‘kunyit’). If I recall correctly, I last saw this species during my teens. The ones that have visited our garden previously are green in colour, unlike this two-toned critter. Do sit back and enjoy the awesome photos of Grasshoppers of the World by Arthur Anker…. best to click the ‘Slideshow’ button for a relaxing and hands-free entertainment. Amazing collection… 402 shots in his flickr set, I’m absolutely overwhelmed! Kudos to Arthur for sharing! 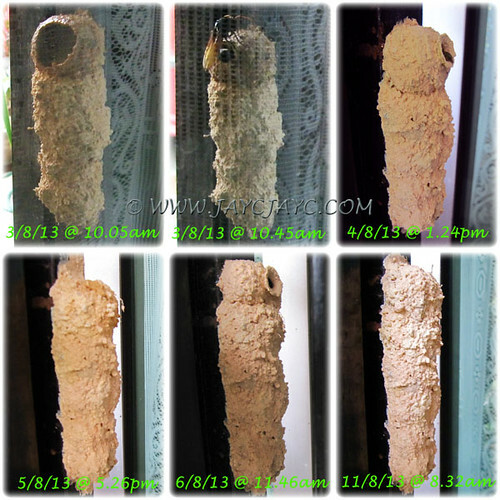 Potter/Mason Wasp nest-building on our sliding grilled gate. These wasps are frequent visitors to our garden and their mud nest are seen occasionally on some of our plants, gates, windowsills and the likes. Usually, the nests are tiny and we just squash and remove them. However, this time around, I was intrigued as this particular nest was quite large and the nest-building process was ongoing. Generally, it’ll visit its chosen patch of mud, forms a tiny ball of mud and carries it to the nest site to mound into place with its saliva before flying off to collect more. Many frequent mud-collecting trips were made to build this nest. I was indeed fascinated just watching its labourious task face-to-face for the first time and extremely delighted to have obtained many shots. Observed that it had built multiple individual brood cells vertically. After each cell was done with an opening, it’d lay an egg inside and sealed it. Much later, it would unseal the opening and returns with a prey, place it inside as food for the single wasp larva and then sealed the opening again. It’d repeat the whole process, building one cell at a time, one on top of the other. When the mud nest was finally completed, I think it consisted of a string of five individual cells, measuring 11.5 cm tall and 2.54 cm wide. Awesome work of art! To-date, the mud nest stands as is… wonder when the nymphs will emerge? Hmm… putting my curiosity on hold, though itching to break it! 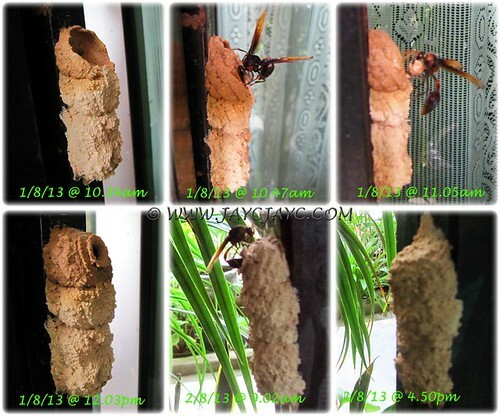 More details on Potter Wasp at Wikipedia. 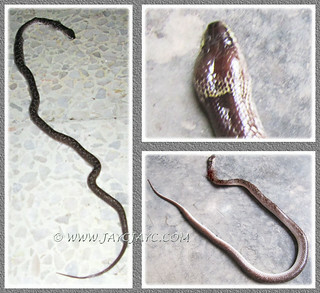 An unwelcome visit from a brown Grass snake about ten days ago, not the first time, though! Eeeek… it was not seen outside in the garden but came right into our home in the darkness of the night! This is the fourth time a grass snake had managed to sneak its way into our home. Hope it’d never happen again. Thank goodness, I was fully awake when descending the stairs after a good night’s rest, otherwise I would have stepped on it and drop dead out of fright. As usual, the man of the house did the needful and got rid of it pronto. Last but not least, a gigantic monitor lizard came a-visiting too. Read about it here. We praise and thank God for such wonderful encounters with His awesome creation! Wow… was I excited 3 days ago. Happened to peep at the potter wasp’s mud nest that morning and noticed something trying to break through a teeny-weeny hole. Quickly ran inside to get my camera and started a shooting spree on the sequential emergence of the nymph. Such a joy and delight to witness this awesome event happening right before my eyes, lasting about half an hour… and at the same time thanking God for this precious gift! I’m mighty glad that I held on to my curiosity and didn’t break the nest earlier. Just realized that it was about a month’s wait for the complete life cycle… that’s the period taken for the adult to emerge from the time the egg was deposited inside the nest. Happy ending of a pretty critter … a new life had begun! !